In August 1960, Anna Halprin taught an experimental workshop attended by Simone Forti and Yvonne Rainer (along with Trisha Brown and other soon-to-be important artists) on her dance deck on the slopes of Mount Tamalpais, north of San Francisco. Within two years, Forti’s conceptually forceful Dance Constructions had premiered in Yoko Ono’s loft and Rainer had cofounded the groundbreaking Judson Dance Theater. 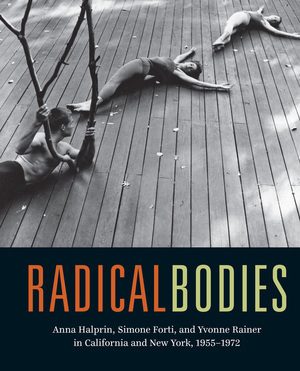 Radical Bodies reunites Halprin, Forti, and Rainer for the first time inmore than fifty-five years. Dance was a fundamental part of the art world in the 1960s, the most volatile decade in American art, offering a radical image of bodily presence in a moment of revolutionary change. Halprin, Forti, and Rainer—all with Jewish roots—found themselves at the epicenter of this upheaval. Each, in her own tenacious, humorous, and critical way, created a radicalized vision for dance, dance making, and, ultimately, for music and the visual arts. Placing the body and performance at the center of debate, each developed corporeal languages and methodologies that continue to influence choreographers and visual artists around the world to the present day, enabling a critical practice that reinserts social and political issues into postmodern dance and art. Published in association with the Art, Design & Architecture Museum, University of California, Santa Barbara. Ninotchka D. Bennahum is a professor of dance history/theory/performance studies in the Department of Theater and Dance at the University of California, Santa Barbara. She is the author of Antonia Mercé, La Argentina: Flamenco and the Spanish Avant Garde and Carmen: a Gypsy Geography. Wendy Perron, author of Through the Eyes of a Dancer, danced with Trisha Brown in the 1970s and choreographed more than forty works for her own group from the 1970s to the 1990s. Former longtime editor in chief of Dance Magazine, she now writes for Dance Europe and teaches at NYU Tisch School for the Arts. Bruce Robertson is a professor in the history of art and architectureand director of the Art, Design, & Architecture Museum, University of California, Santa Barbara. He has published books and curated exhibitions across a wide range of topics, from the sixteenth century to the present.